One question that many storage customers frequently have is, “What size storage unit will I need?” At Mini Price Storage we make it very EASY for our customers. Our self storage team members are happy to help you determine this! With a quick phone call or stopping by one of our storage locations, our team members can give you some guidance to determine an appropriate size. Another convenient way to figure out what size unit you may need is by using our handy-dandy online self storage size guide. 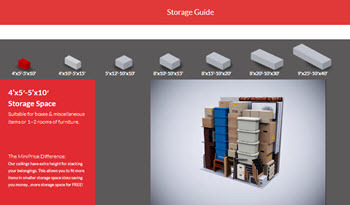 You can thumb through the different size storage units that we have and see what each size is capable of storing. Feel free to contact us today at 1.866.531.2675 with any of your storage questions!